December 15, 1914, killed 687 workers. After an accident, we often reflect on what could have been done to prevent it, but do you ever considered how you would act in an emergency situation before you're in one? Have you ever thought about it beyond the weekly toolbox talk or the annual safety training? Here's five points to consider before you find yourself in an emergency situation. 1. Decide on how you want to help. If you are the type to step in and save lives, make sure you assess the situation and listen to people's concerns. Put yourself in their shoes and avoid losing your patience by expecting more from them then what they can give. This can be practiced by learning about the kinds of strengths and weaknesses members of your crew, including you, display regularly, especially when things get a little hairy. 2. Learn from the successful actions of others. When the evacuation alarm sounds, the best move is to follow your training. Stick to the plan your employers have designed for the safety of all employees. If you think you're tough enough to stay where you are, in the middle of a disaster scene, rethink your choice and make moves to safety as soon as possible. As you walk your normal routine, think of different structures or equipment that could obstruct your exit and plan an alternate route. 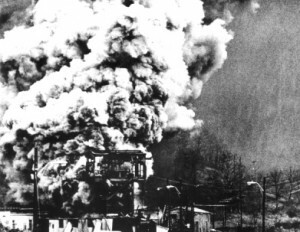 The next time you see a coal mine disaster on the news, remember that it could have been you. Mining isn't statistically the deadliest job, but there are plenty of ways to die every time you punch the clock, start your machine, or dump over the stock pile. 4. Avoid the bystander effect. According to psychologists, the bystander effect says that the more observers at a scene, the less likely anyone will intervene. Don't be an observer doing nothing. You don't have to be superman, but communicating with 911 rescuers, assigning tasks to other potential bystanders, retrieving supplies, or taking note of the time or other details that might help doctors save your coworker trapped beneath a beam. Do something. Anything. Just don't stand around when someone needs to be rescued, especially if you think you can't do anything. If all you do is not add to the bystanders, you have done something to help the victim. So the next time your boss catches you standing around, get to work and keep it that way. 5. Teach empathy to others. The news can make disasters not seem as real is they are. Maintain your human element when reflecting on disasters. Put yourself in the situation and imagine how you would feel. It's important to explore your emotions hypothetically because anger is often a secondary emotion. If you are aware of how you feel about certain traumatic situations, you might be able to control your anger and make better choices. It's tough for us to think about bad stuff when we work under such dangerous conditions, but don't repress those hypothetical thoughts if they come to mind. In fact, you and your coworkers will be better off if you share your concerns and discuss what could be done to overcome the situation before a bad one becomes worse. Five tips adapted from an article on by Susan Krauss Whitbourne at Psychology Today.